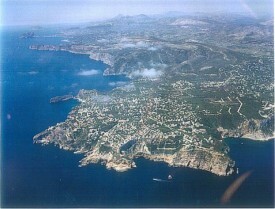 Javea is a very sought after area amongst property buyers and holiday makers. This is especially so for those looking for Villas in Javea. Thanks to strict building regulations Javea has minimum amounts of high rise buildings, allowing the Javea Villas spread around the valley fantastic unobstructed views of the Spanish country side and the Mediterranean Sea. Javea is largely a family town with housing consisting of mainly Villas in various urbanisations, with some Villas in Javea set amongst the beautiful orange and olive groves. Villas in Javea consist of many variations, the Tosalet urbanisation provides level ground with wide streets, and is close to the Arenal area of Javea with its shops, restaurants and sandy beach. If you prefer for your Villa in Javea to be set on the hillside, there are many options including Adsubia with its commanding views over Javea and to the other side the Granadella National Park. Villas in Javea situated in Balcon Al Mar, which literally means balcony on the sea have spectacular sea views from this peninsular on Javea, with a short drive to the local amenities of Javea Arenal and Javea Port areas. For those that are looking for a modern spanish Villa in Javea, there are many new urbanisations being completed, and still under development, offering you a taste of modern spanish life, and a family home that is complete with all modern applicances fitted such as central heating, underfloor heating and air conditioning throughout. If you purchase a property that is off plan, you can often save a large percentage on the sale price, though you will have to wait 1 or 2 years depending on the contract and urbanisation for your Villa in Javea to be complete, and ready to move into. To find out more about Villas in Javea for sale, and what may be available for you, please contact us to discuss your requirements and how we can help you find your dream Villa in Javea. Alternatively, please see below to search our online database of Villas in Javea.